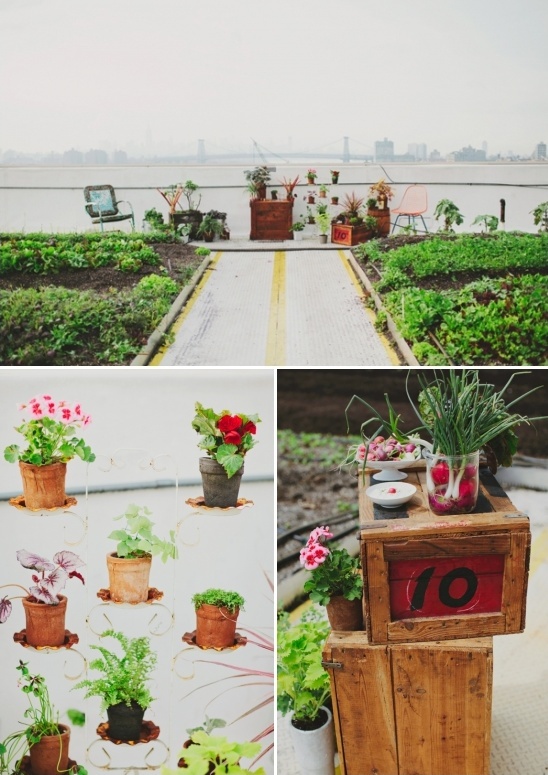 The talented experts at Viva Max Weddings and Molly Oliver Flowers teamed up to create our next unique wedding inspiration set at the amazing Brooklyn Grange Rooftop Farm. 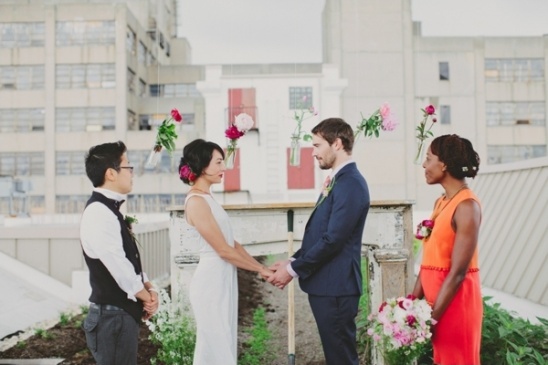 Despite the urban surroundings, this rooftop wedding inspiration has all the wonderful rustic flair of a rural farm wedding. 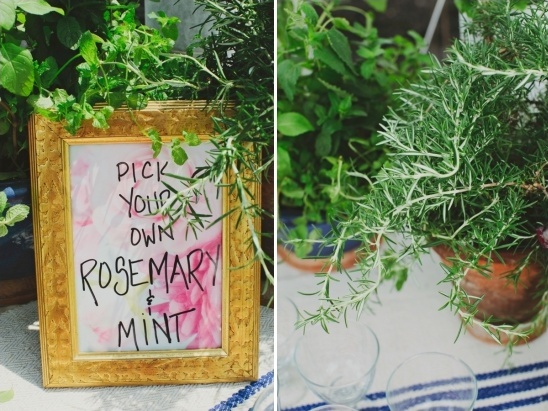 Using vintage furniture and organically grown vegetation as the main decor, this urban wedding is sure to appeal to the eco-conscious couple! 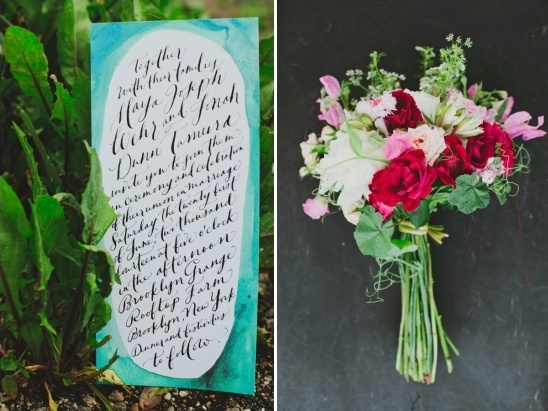 Can't get enough of these rustic urban wedding ideas? 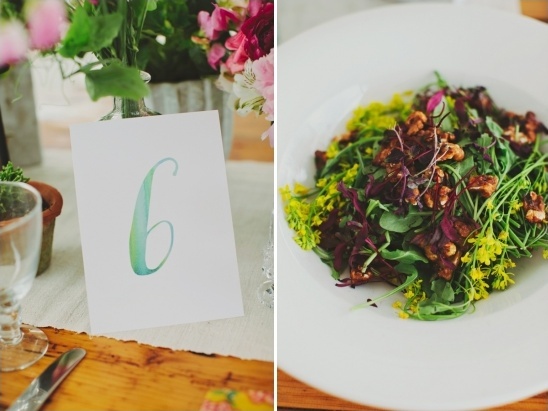 Then head to the full gallery here to see more of the beautiful images Les Loups captured of this rooftop farm wedding inspiration. 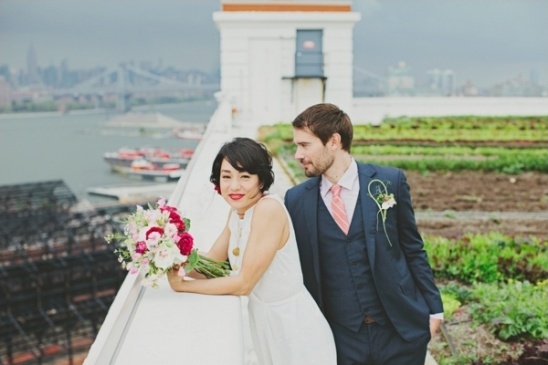 From Viva Max Weddings:This shoot, produced by Viva Max Weddings and Molly Oliver Flowers, celebrates the beauty and abundance of Brooklyn farming while highlighting an amazing wedding look that is bold, rich, lush and of course beautiful. 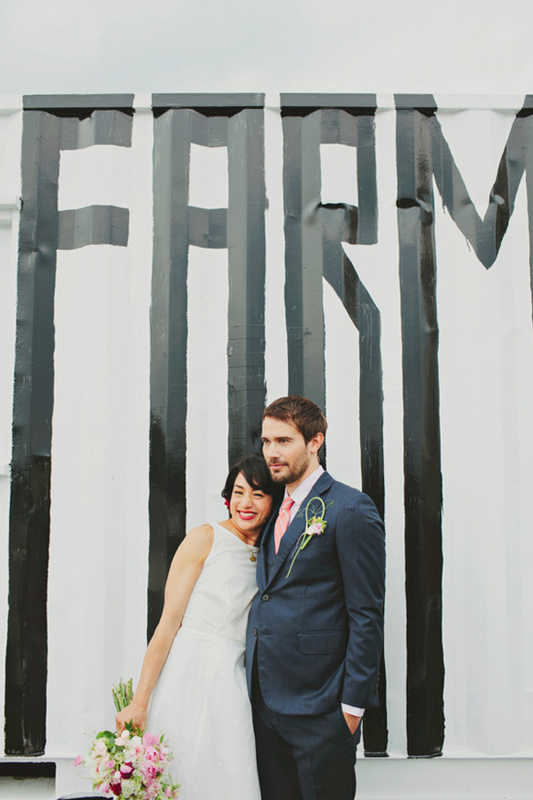 We wanted to show that a farm wedding can be elegant and hip, not just hippie. 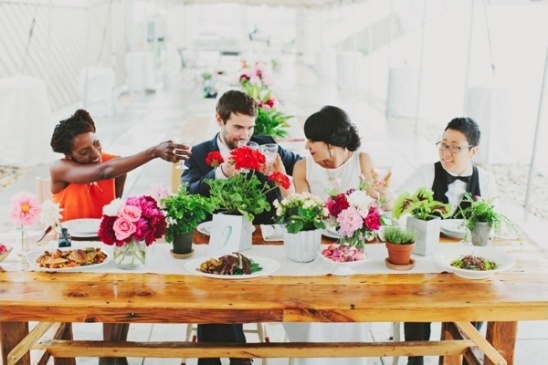 Viva Max Weddings and Molly Oliver Flowers curated a group of vendors that really embraced this lush feeling and kept things Brooklyn-focused, beautiful and eco-friendly. Les Loups Pictures + Songs captured everyone's immense talent despite the fact that we were hit by numerous torrential rainstorms throughout the day. The images are breathtaking. 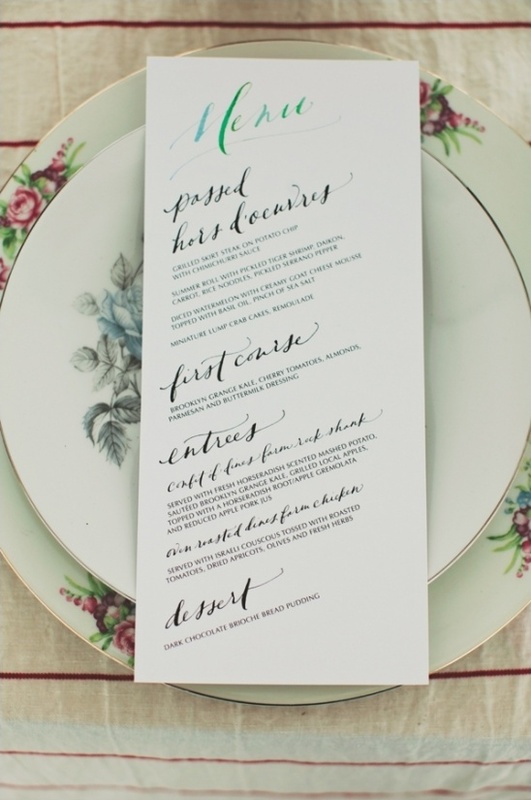 Paperfinger’s hand written calligraphy was sprinkled throughout the shoot. That splash of color and wild feel to her words added so much energy to our look. 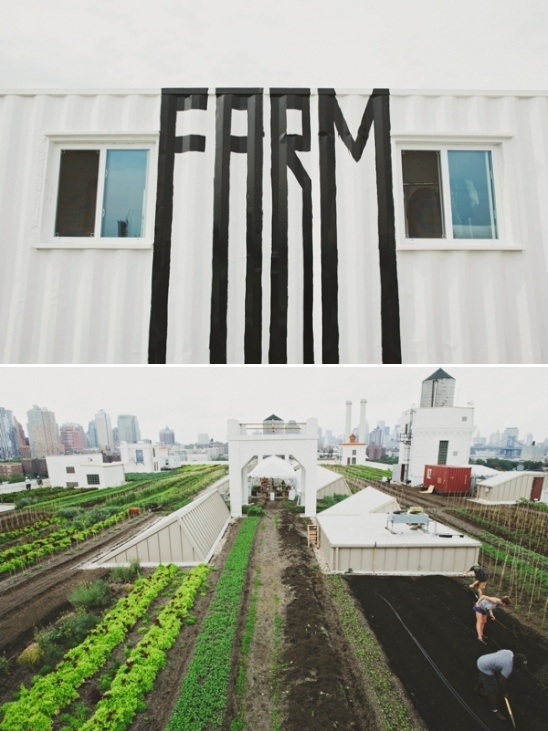 The Brooklyn Grange Rooftop Farm, with their 180 degree views of the New York skyline along side rows and rows of thriving vegetables and plants, is a space that perfectly marries the beauty of both the urban and the natural. That weaving dichotomy is carried throughout the shoot - there is not a moment where the two are not in play. 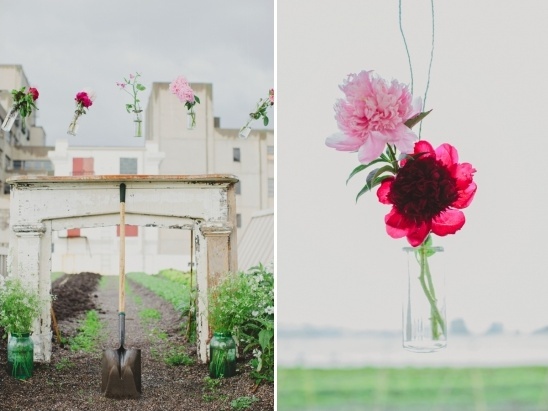 For ceremony, for example, Molly Oliver Flowers extended floral details from the sky so that the blooms danced in front of a concrete city landscape, never allowing the eye to loose touch with nature. Molly Oliver Flowers is one of the only wedding florists in New York City that grows their flowers and sources exclusively from local farms. 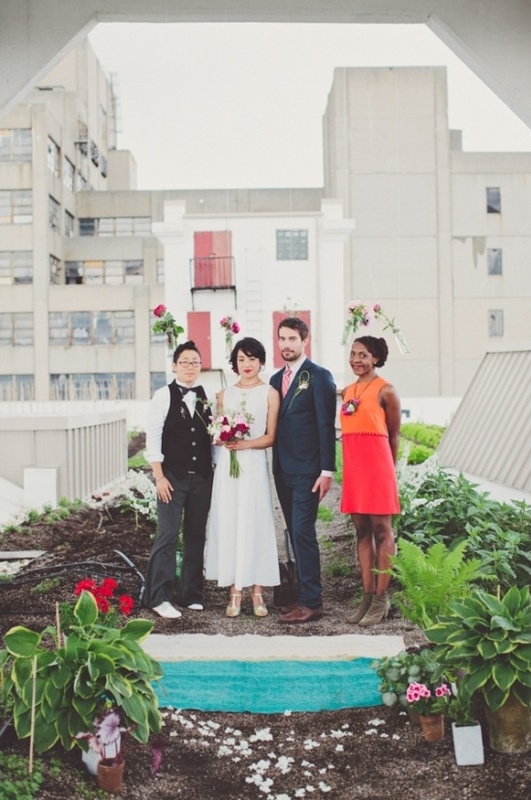 They contacted Viva Max Weddings with a desire to work with the incredible people at Brooklyn Grange Rooftop Farm to show off the stunning wedding venue located on a fully functioning urban farm. The models wore looks from Carleen and Brooklyn Tailors, two cool New York designers. Their looks showed off the truly fashionable nature of a Brooklyn crowd. Erica Weiner showcased their affordable and stunning vintage wedding and engagement rings as well as the perfect party accessories. Blades Natural Beauty uses all natural products so they really meshed well with the core values of the farm. 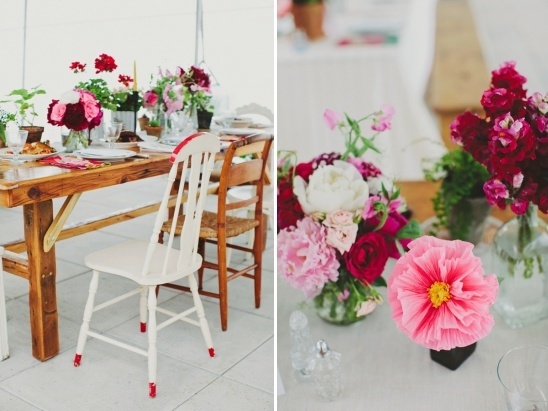 The furniture, props and tabletop rentals came together beautifully from a few very different sources. 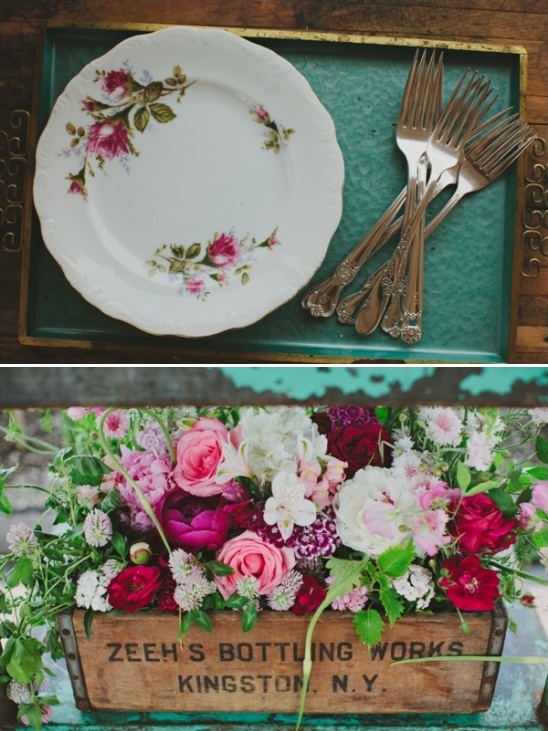 Patina Vintage Rentals, GRDN and Little Vintage Rentals. 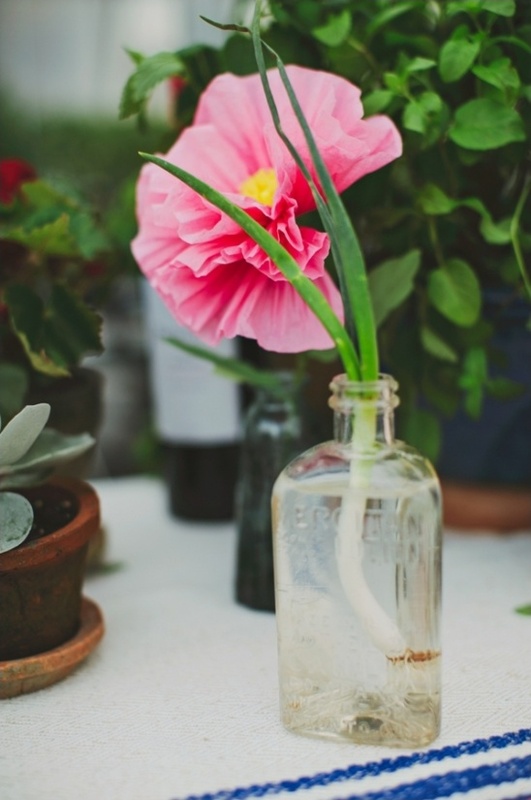 GRDN, an urban gardening home and décor shop, provided recycled glass wine glasses, natural linens and the perfect favor: Hudson Valley Seeds. 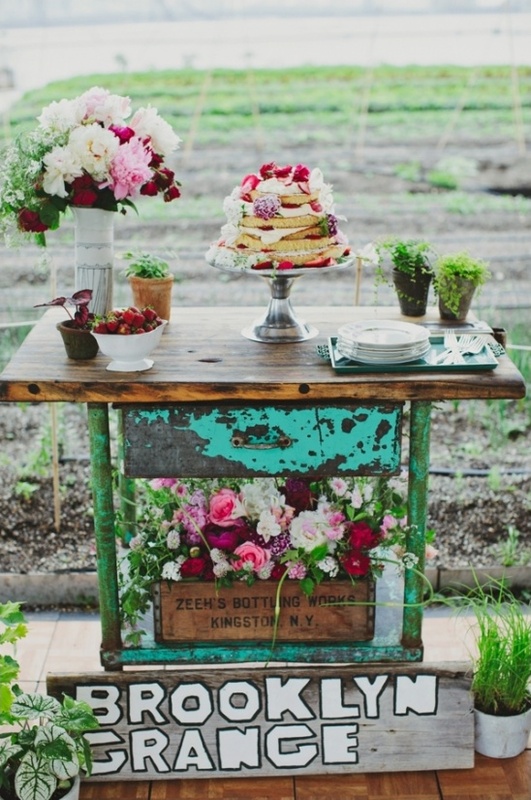 Patina Vintage Rentals gave us a mix of natural and bright furniture items that gave the setting some pop. And their chippy mantle piece was a great ceremony backdrop. 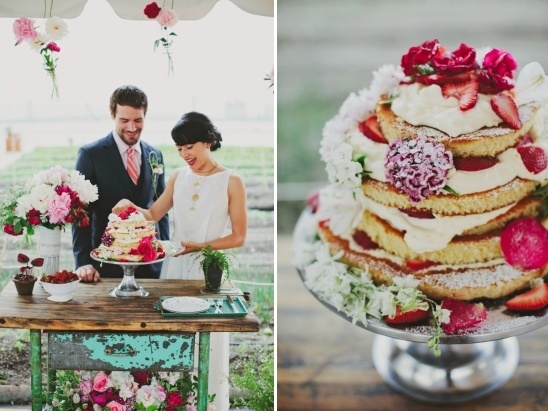 Parker Red Catering is a neighbor of the Grange, also located at the Brooklyn Navy Yards. 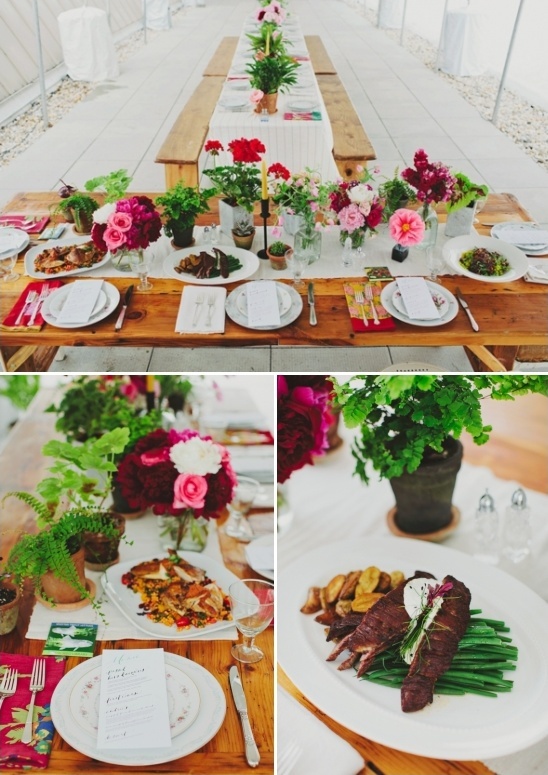 Their dedication to seasonal local foods meshed perfectly with our farming vibe. They even used some of the Grange’s edible weeds in the salad. 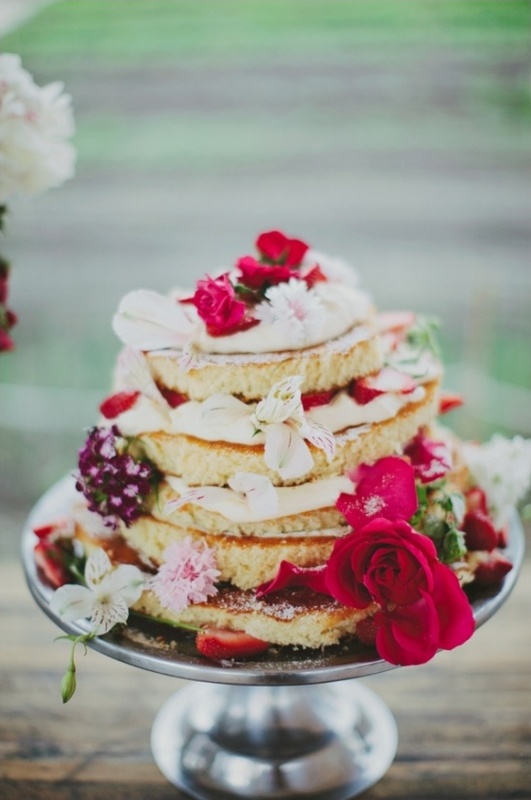 We didn’t want to follow a standard rustic tradition. 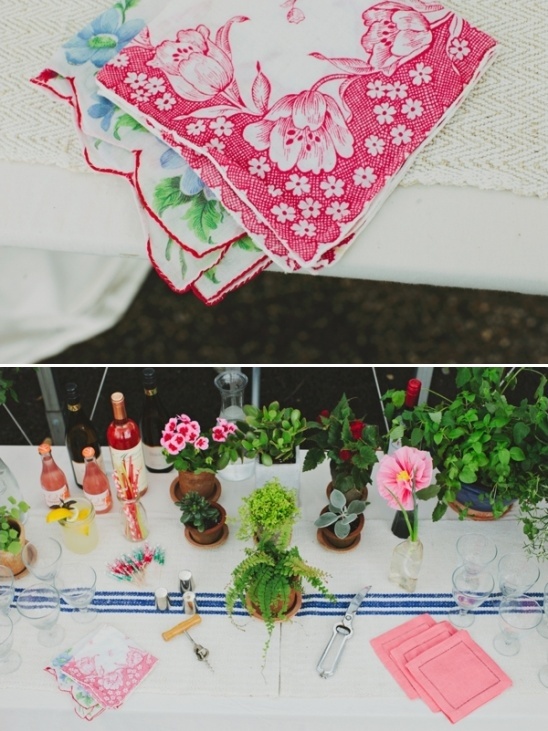 Instead, we wanted all the elements to read as a continuation of the flowers and plants that surrounded them. The plates and furniture almost seemed to blend right into Molly Oliver Flowers’ potted plants and full blossoms. 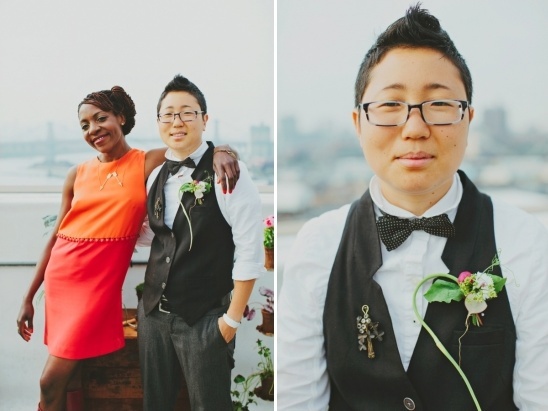 It was a constant celebration of life and love – and that is what a wedding means to us.